Firm Brings Entry-Level Housing Opportunities to East-of-the-River Neighborhood in Washington, D.C.
Washington, D.C., March 14, 2005…Just a block off Pennsylvania Avenue in the long-neglected Washington, D.C. neighborhood of Randle Highlands, Drummond Development has begun construction of Penn Circle, an all-new condominium residence with 36 one-and two-bedroom homes set to deliver this summer. With prices starting in the high $100,000’s, Penn Circle will provide exciting entry-level home ownership opportunities in a convenient location with easy access to downtown Washington and the proposed light-rail line linking nearby Metrorail stations. Drummond acquired the 50-year-old apartment building at 1501 27th St., S.E. last year and began gutting the building promptly. The completed condos will feature spacious, bright, contemporary floor plans, all-new kitchens and baths, hardwood floors and carpeting, and oversized double-paned windows providing an abundance of natural light. 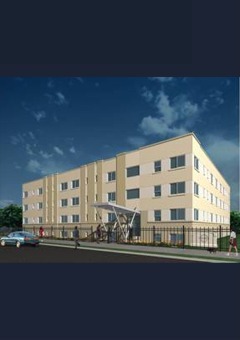 Each unit will have its own all-new heating and cooling system, water heater, and washer/dryer. In upgrading the building’s wiring, Drummond will provide each room with easy-to-use cable, high-speed Internet, and phone connections. Special sound attenuation materials will be used to ensure that residents can enjoy their homes in peace and quiet. Floor plans and other information are available on the Web at www.penncirclecondos.com. Drummond Development is a major force in transforming urban Washington, DC into a vibrant, desirable, and economically strong 24-7 residential community. A subsidiary of Washington-based Urban Investment Partners (UIP), Drummond combines local entrepreneurial expertise with global financial strength. Drummond is the developer of five quality multifamily residential projects in key urban neighborhoods in the nation’s capital — Capitol Hill, Columbia Heights, Randle Highlands and Glover Park. These unique homes, ranging from affordable to upscale, provide diverse home ownership opportunities for a wide variety of Washington, D.C. buyers. For more information, see the Company Web site at www.uipllc.com . Rendering is available: email lhbpr@attglobal.net.